Inspired by the summer season, assorted cooking shows, and my brother's pictures of his BBQ goodness, we decided to try some new recipes for our summer get together. 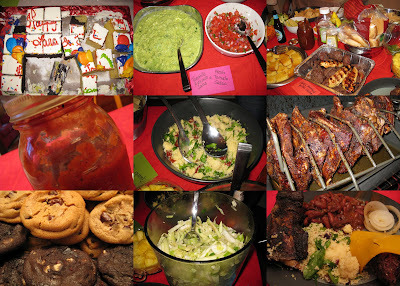 You can stop by any party this time of year for burgers, hot dogs, potato salad, and traditional cole slaw - not here! We had a delicious spread of food and I can't imagine that anyone went home hungry. While this might seem like an intimidating list of foods to prepare, it is easy for you to do at home. There are some shortcuts that you could take (i.e pre-chopped veggies) to save time or you could enlist a few friends to help out. Most things can be prepared a day or two in advance and stored in the fridge until the guests arrive. I used a few recipes that I've posted previously (links to posts are included below). Here's the menu for the party - descriptions of the new recipes will follow shortly. I've got a lot of writing to do!